Some of R. Baker & Son’s more challenging demolition projects involve removal of huge old boilers. 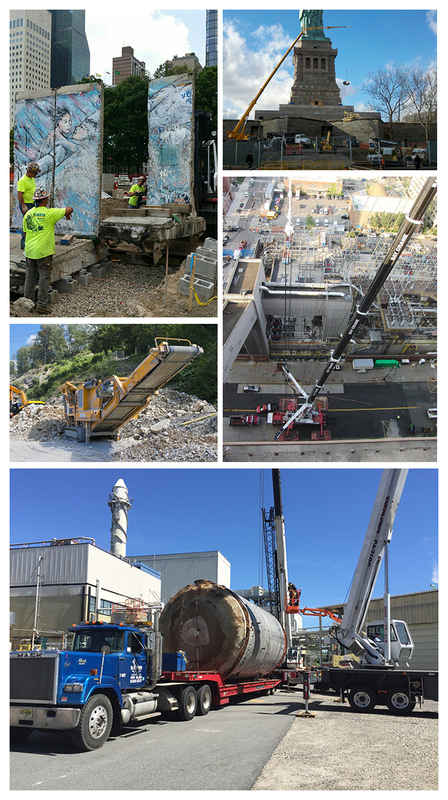 Baker crews were engaged in a demolition project at leading New Jersey pharmaceutical facility in which outdated, inefficient boilers were replaced by multiple smaller high-efficiency boilers. This is a service we’ve performed numerous times for energy-conscious clients as of late. Three or four smaller high-efficiency boilers can be installed within an old boiler’s footprint, and will significantly outperform the old boiler. Years ago, boiler vessels were usually rigged into place, in one massive piece, early in a construction project, and the structure would be built around it. Oftentimes there are multiple boilers of various sizes to handle the heating load of a building. Most of these inefficient old boilers are located in congested mechanical rooms, surrounded with equipment such as air compressors, pumps, aerators, chillers, water treatment skids, etc., as well as piping, electrical conduit, controls, sprinkler lines, and other systems. All of these items serve to complicate a demolition project. Many demolition and selective demolition projects require the dismantling and removal of large boilers without disturbing surrounding equipment or disrupting operations, so intensive planning and coordination are required. Everything must be identified and plotted, and a specific safety plan must be compiled with a task hazard analysis. Items like conduit, control wiring, or plumbing may require relocation before the boiler can be cut up and removed. In order to keep a safe work environment, proper ventilation and smoke controls must be put in place prior to demolition activities. The accompanying photo of boiler removal is from a recent R. Baker & Son demolition project at a large pharmaceuticals facility. Many facilities are undertaking similar projects.